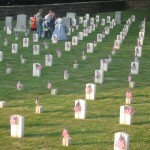 The Grafton National Cemetery was established in 1867 as a burial site for Union soldiers killed in the recent Civil War. 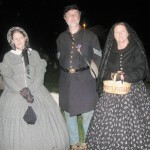 For the last several years, Mark Tennant, with some sponsorship from the Spirit of Grafton committee,Â has been organizing a lantern tour of the cemetary, and did so again this year on the evening of Friday,Â May 25th. 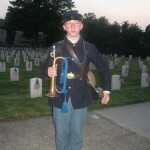 Mark has done extensive research into the soldiers buried here and much of the presentation consists of narrating different individual’s stories. 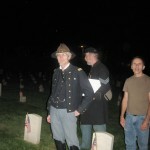 I usually portray General John “Black Jack” Logan, who, as commander of the Grand Army of the Republic, ordered his membership to recognize Memorial Day. 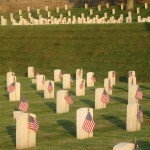 This paved the way for the regular observance of this patrioticÂ and reverential observance. 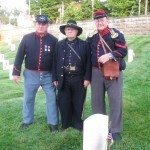 Several members of the West Virginia Reenactors Association turned out for the evening to assist with the event. 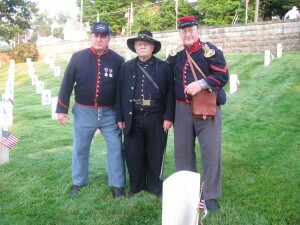 The Sons of Union Veterans, Buckhannon Camp #49 also participated. 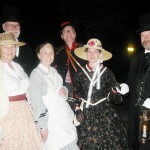 We had beautiful weather this time out and about 150 appreciative spectators. 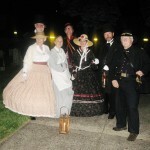 While this event is a small, one evening-only affair, it is worth taking the time to attend. Mark deserves a lot of credit for putting it together.